Pyromancers are talented individuals who specialize in controlling the element of fire. As magic-users, they are quite fragile. However, they have devastating offensive skills in their arsenal that will leave behind a trail of burnt enemy ashes. They can also summon fire elemental minions to increase their fire power or to serve as protection against attacks. Pyromancers are gifted with high WIS to enhance their mana capacity and strengthen their magic skills. As the guardians of nature, Satyrs are the ones who exhibit high WIS, making them one of the most viable races for the Pyromancer class. 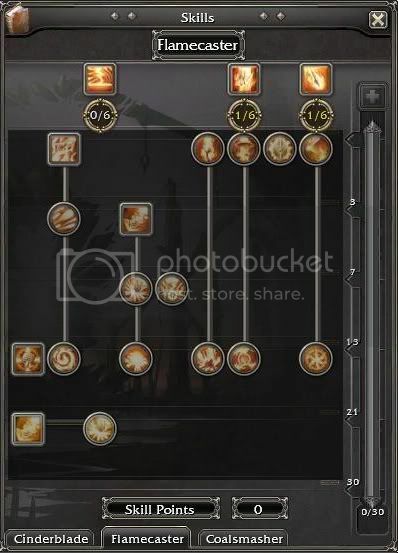 Pyromancers also have three skill threes called Cinderblade, Flamecaster, and Coalsmasher. The Cinderblade tree is an interesting build since it makes the Pyromancer a close-combat fighter. His skills enhance the damage of melee-based attacks by increasing power or flame damage. Since the tree forces a fragile Pyromancer to get up-close, they also have skills that turns flames into a mighty barrier. Flamecasters are mid to long-range casters. They want to keep a safe distance from enemies while casting their fire spells. Their skills focus on setting enemies aflame to do damage over time. Lastly, Coalsmashers are good at crowd control and summoning. They have skills that burn enemies at an area, causing large amounts of damage to a lot of monsters. They are also talented with the art of summoning wisps and fire golems. The wisps add to the damaging capability of the summoner, while the golem acts as the Coalsmasher’s protector. 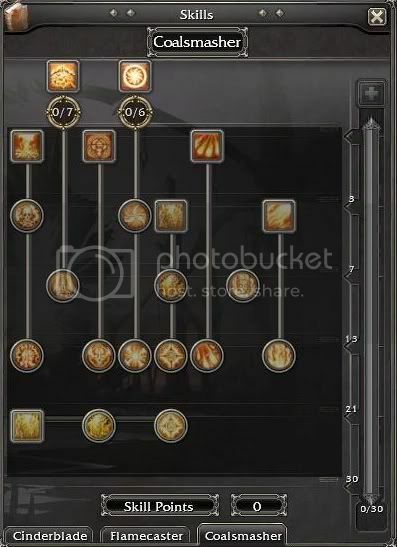 Pyromancers value WIS above all else to strengthen their spells. Thus, common weapons for them are staves and wands. However, they may also wield melee weapons should they choose the path of the Cinderblade. Experiment and explore! Not all Pyromancers are Satyrs, and wands are not their only weapons of choice. Who knows? You might encounter a sword-wielding Human Pyromancer who’s bashing monsters with enormous strength. yes me =p im gony tear it up with cinder, the only problem is balance i spent god knows how much on the item shop for respecs to try and get a stable viable STR based pyro. I didnt manage it i came close very close but never managed to get life% mana% draw gear required for survivability. doing those reputation quests nearly made me quit the game, infact i know a few who quit after doing so many rep quests for gear. Back when i tried it we could hybrid more freely so the tier tree changes will mess me up a bit not looking forward to work arounds. Never the less i shall attempt another str pyro hope to exchange info with any one else thats going to attempt this build. Do life-drain stuff work with spells too or just normal attacks/skills? What about summons? 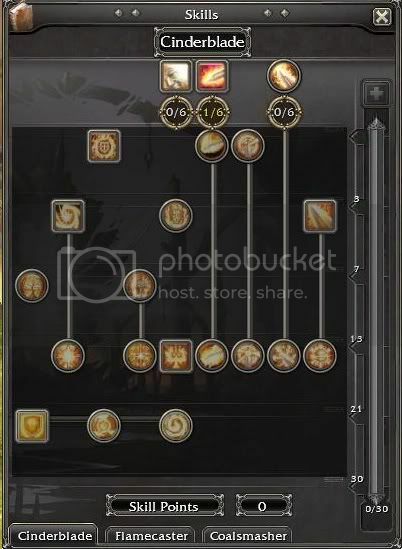 ive had a quik browse on the skill calculator our options dont look that bad, there is lots to play with.